The Singing Machine Company announced today that under a licensing agreement with Universal Music Enterprises, it will release on October 15, 2003 an exciting new series that brings the original Motown artists home for karaoke fans. Original Artist Karaoke will be introduced in six separate volumes, for a total of 48 songs. Each of the songs on the CD+Gs (CD plus graphics), including all-time classics like "My Girl," "ABC," "Dancing in the Street," "Let's Get It On" and "Stop! In the Name of Love," features the original Motown instrumentation and background vocals. Each song will also be heard twice: the song with the original lead vocal isolated in one channel and the backing track in the other; and a second stereo mix of the song, allowing the karaoke fan to sing along with only the music and the background singers. The Singing Machine will introduce a co-branded player - a signature Motown karaoke machine in the likeness of a retro-style jukebox. The Motown machine is equipped with The Singing Machine's "auto voice control" technology, which allows singers to rehearse "I Hear A Symphony" with The Supremes or "The Tears Of A Clown" with Smokey Robinson & The Miracles. When the karaoke fan begins singing, the Motown lead disappears, giving the karaoke artist the solo lead. These CD+Gs are also compatible with most CD players. Other classic songs in the Original Artist Karaoke CD+G series include hits by The Temptations, Jackson 5, Martha & The Vandellas, Marvin Gaye (solo and with Tammi Terrell), Four Tops, Gladys Knight & The Pips, Jimmy Ruffin, The Marvelettes, Mary Wells, Edwin Starr, Jr. Walker & The All Stars, Eddie Kendricks, The Originals, The Velvelettes, Isley Brothers, and The Elgins. "The release of the Original Artist Karaoke project is a milestone for the karaoke Industry," said Jack Dromgold, Executive Vice President of Sales and Marketing with The Singing Machine. "Karaoke music has hit the mainstream. These new CD+Gs will inspire amateurs and professionals alike with the actual Motown 'Hitsville' session recordings as their accompaniment tracks. The emotional connection to the original songs and performers is powerful and cuts across generations." The CD+Gs are expected to retail for $12.99. The Jukebox-style karaoke machine is expected to retail for $149.99. The CD+Gs and Motown karaoke machine will be available at electronics and music retailers nationwide. Founded in 1982, The Singing Machine Company develops and distributes a full line of consumer-oriented karaoke machines and music under The Singing Machine, MTV, Nickelodeon, Hard Rock Academy and Motown brand names. 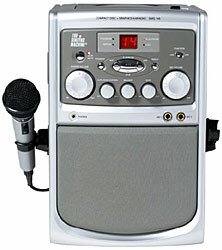 The first to provide karaoke systems for home entertainment in the United States, Singing Machine sells its products in North America, Europe and Asia.